Want to start a Latina Mami chapter in your area? 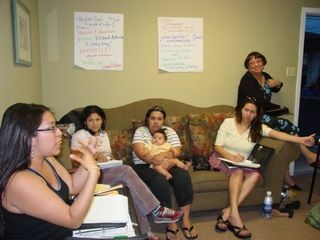 We are a collective of Latina mothers, working on a variety of child advocacy, reproductive justice and disability and racial justice issues for ourselves and our children. Our story is not unique in that we organize ourselves and mamis and families much like women around the world are doing globally: on a local level, using native knowledge, and in ways that are familiar to us. Latina Mami first began in 2000 in Texas, and was founded by a 25-year old new Latina mother who was not able to find services for herself outside the social service-based model. Gloria Perez-Stewart began organizing mother’s groups, platicas, cultural events and then organized a local radio show run for 8 years by mamis and children. She also organized a clothes closet with items for trade, informal birth support for immigrant women in public hospitals, and Mami leadership training. Latina Mami served over 1400 women a year by 2008 and has always been led by the women it served. Latina Mami has been recognized for its grassroots efforts by progressive foundations, Latina Magazine, Univision, and even written about in academic feminist journals.